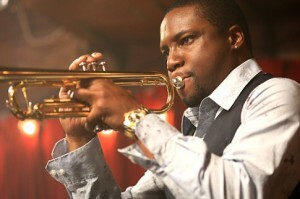 Like Wendell Pierce, Rob Brown is forced to act with a horn on Treme. Delmond Lambreaux is a jazz trumpeter; Brown isn’t. Like Pierce, he’s forced to look convincing as a musician which means learning some basics, but that doesn’t mean he doesn’t appreciate the experience. Were you into jazz before you started Treme? Not at all. And I don’t play, I just fake it. I’m at an eighth-grade level, so I just delved into it, and it’s been very rewarding. At first, it was terrible because the trumpet is impossible. Basic stuff like G is difficult, but now I’m getting more comfortable with the instrument, so it allows me to enjoy the music for what it is. It’s like, “What are they playing? Oh I kinda know what that means now.” I appreciate virtuosity a lot more. Is it cool when you have musicians like Christian Scott playing right next to you? Yeah. We shot our Jazz Fest scenes yesterday. (This interview was taped during Jazz Fest.) I’ve had a bunch of scenes with Dr. John. Playing alongside them, that’ll be [with me] forever. The question Delmond’s dealing with—how do you hang on to the past but still be contemporary?—is one of the most basic ones that New Orleans musicians face. I don’t think people really have a say in the matter because you guys are so conscious of preservation. I don’t think you guys would ever let the future come without holding on to the past. It’s just not your style. You guys don’t change that much; you like your stuff! Is acting with musicians a challenge? Yeah. Sometimes they’re trying to figure out their way (with the acting), I’m trying to figure out my way with the music, and we meet in the middle. And it’s worked out. But the same way I look at them, they look at me. It’s been cool. I don’t play, so all my solos have to be prearranged. Whoever’s playing, that’s so foreign to them because jazz is all about improvisation. They’re getting used to doing something over and over and over again, which is something they’re completely not used to. That’s what I am used to. But it’s worked. So are you working on becoming a player? I’ve been watching and I think Rob does a great job faking it for us non musical types. Plus his passion for the character and series shows. I am so jealous of them, getting to be and shoot in New Orleans, and tell the story so well! The Lambreaux men are great charaters. I’m enjoying New Orleans, the music, and the Treme storylines a lot.